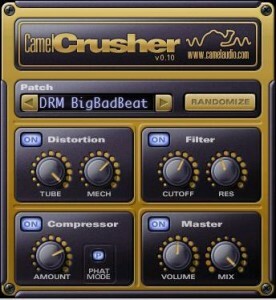 CamelCrusher is a free ‘colouring’ multi-effect plugin. It offers two characteristically different distortion sounds which can be blended together to create a wide variety of tones and textures. Great for guitars, drums and plenty more! System requirements:PC Pentium III, Windows 98/ME/2000/XP, VST host. Mac Intel or G4 (Universal Binary), Mac OS X 10.3.9 or later, Audio Units/VST host.